An API delivered with JLupin Platform's libraries for a business solutions developer enables simple subsystem executions. It also enables simple executions of other code fragments in an asynchronous manner which allows shorter main thread executions. A given code working as the main thread has to handle four requests for the A, B, C, D subsystems. The synchronous execution for the above mentioned subsystem will last approximately 4.5 seconds. 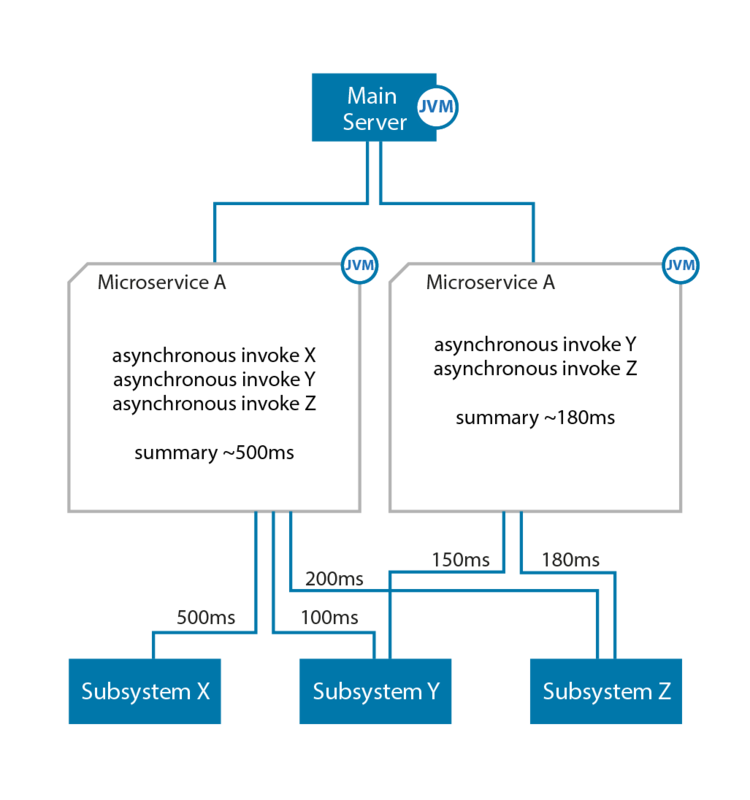 If we execute our subsystems asynchronously we may lower the delay to the time of the longest lasting request of the given subsystems - in this case subsystem C - 2 seconds. The most important assumption: Requests to subsystems are non dependent on one another.Â The analysis of the result may occur after the request execution. Consider the following hypothetical example of executing queries for the above mentioned subsystems. The private methods 'callASubSystem, callBSubSystem, callCSubSystem, callDSubSystem' in the above example emulate execution of subsystems A, B, C, D Â - the thread becomes idle for the emulation's estimated time. Every subsystem has precisely the same response time as mentioned at the beginning of the chapter. The methods return various objects to show variety only for the purpose of the example. calls subsystems in a synchronous manner in order one after another which causes the response time to add up. The response time is approximately 4.5 seconds. calls subsystem in an asynchronous manner with the help of the JLupinConcurrentTaskExecutor mechanism. The first constructor parameter is a key on which we will refer to the task's results, the second one is the maximum time for which a thread will be blocked in order to await the task completion - it should be longer than the longest estimated (worst case scenario) response time of the subsystem. The third parameter is an array of parameters that can be taken in the method 'task (Object  args)' under the respective indices which is shown by the mentioned example. The fourth one, the logger, is already known. The JLupinConcurrentTaskExecutor class is the main mechanism which asynchronously performs the tasks' execution. This class should be a singleton in the given class or even a system - it is important that keys for tasks should not be mixed within the system or class that makes use of this mechanism. In the 'execute' method the JLupinConcurrentTaskExecutor accepts a single task object or an array of tasks. The tasks are executed without the key - without queue polling - without awaiting the results. To perform such tasks use the JLupinNonBlockingTaskCallable task class. The constructor performs tasks in an asynchronous manner without awaiting the results.